Studio Green is passionate about the creation of truly unique spaces. Each design is a direct response to the site’s built forms, natural settings, client needsand environmental implications. We focus on blending sustainable and elemental aspects to reach fresh, simple, and elegant design solutions. Studio Green is a collection of deeply motivated and passionate designers, led by principal John Merten. 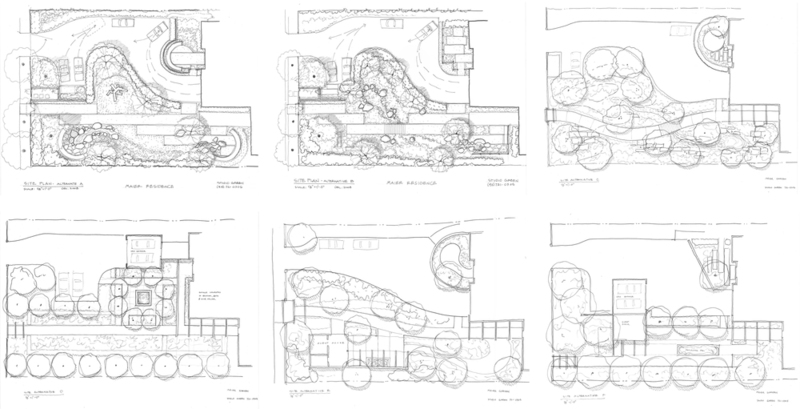 John is a Bay Area native and Landscape Architect with thirty years of experience. His strategic solutions, attention to detail, aesthetic sense, selective editing process, and big thinking approach guide the team. Together, we share both a deep appreciation for and vast knowledge of our inspiring and dramatic environment. The work of Studio Green is a collaborative effort that engages with other disciplines, architects, clients, and communities to generate the creation of distinct and tailored landscapes. Design is the process of combining needs, desires, inspiration, space, and function. Starting with the abstract and moving to actualization, the process is sequential. Our process combines knowledge, intuition, and aesthetic discretion with a pragmatic sequence of studies, refinement, and both graphic and verbal communication. This process leads us to unique, original designs. Every project is special and memorable, with focused goals and logical design solutions. Through interactions with the client, a set of needs is understood, which may evolve due to new ideas, opportunities posed by the site, cost, etc. In the public process, we often interface with the users of a space through a workshop format. We are experienced in helping groups reach consensus by building a common ground between the constituents. We often prepare a site analysis drawing by considering views, access, sun, shade, wind, noise, and utilities. By overlaying the needs for a site, we often identify both limitations and opportunities. The programmatic and site considerations are then synthesized into study drawings. We prepare fast graphic studies and perspective vignettes, illustrative plans, elevations, conceptual diagrams, as well as computer generated 3-D models. More than one concept is always studied. During the discussion with the client of the concept plan and options, the preferred design may evolve from one study, a combination of alternatives, or new ideas. Through the discussion of priorities and budget, we establish a means of moving forward, which sometimes includes phasing or creating a master plan vision of future projects. In this stage, we develop the design, integrating the landscape with the architecture and interfacing with other members of the design team. We explore each element, dimension, and material to find the right balance of aesthetic, durability, functionality, and value. We design challenging features such as fountains, trellis structures, playgrounds, sports courts, pools, and other complex elements. flow patterns and sensitive habitat. Depending on the rules established in the community in which the project will be built, complexity of the project, and sensitivity of the location, design review can take on various forms. During design review, the project will be presented and discussed with a planning approval body, who may approve the project with conditions or require a greater degree of change prior to approval. The documentation for design review typically includes plans, section drawings, notes, and images to allow the general public and reviewing body to understand the intent of the design. The construction documentation includes many types of information: layout plans, grading, notes and specifications, planting, lighting, irrigation, and custom details for all features of the design. Developing the construction documents to a high level of resolution will ensure the bidding and construction processes go smoothly. While compiling the construction documents, we communicate with the client and design team to communicate final refinements and design decisions. When building permits are needed, the building department review of the construction documents is often done simultaneously with the bidding and contractor selection process. We prefer to remain involved during the bidding phase to clarify the design documentation, provide greater detail, or offer suggestions in order to obtain projected costs. The selection process of a contractor often takes into consideration factors such as: cost, responsiveness, thoroughness, demonstration of ability and interest in the project, and personalities. At other times in the public process, bidders must qualify to bid based on a set of defined criteria. The designer should be on-site regularly and at critical moments to be able to refine specific features, make judgment calls, and identify nuanced adjustments to actualize the design. During construction we: update and keep the design documents current; make suggestions for any necessary adjustments or corrective measures to the builder; review samples, materials, and finishes for approval; provide change order requests, if needed, to either increase or decrease the cost for any project changes; and review shop drawing and work with contractors to refine details of custom features.